Are you, or do you know someone, aged between 21 and 35passionate about the Australian beef industry? 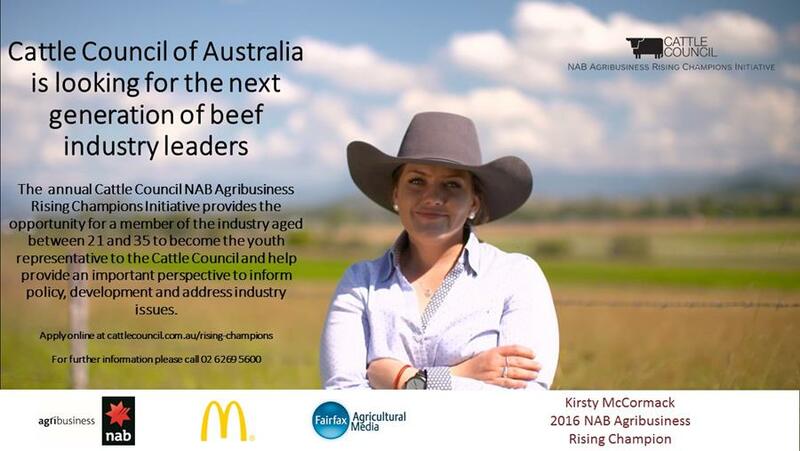 The NAB Agribusiness Rising Champion Initiative will provide you with the opportunity to network with some of Australia’s beef professionals. The contacts gained within this program will contribute to your progression within the beef industry. Through the professional development workshop and attendance at the National Gala Dinner applicants are given an insight in the Australian beef industry, the Cattle Council of Australia operations, the DAFWR operations and network with industry representatives, sponsors, state farming organisations and parliamentary figures. The opportunity to broaden your interpersonal skills throughout our workshops will allow you to market yourself and learn how to represent yourself in a professional and clear manner for your future endeavours. How to apply: Applicants will need to submit a written application outlining their passion for the beef industry. It is not a requirement of the initiative that applicants have qualifications or directly own cattle, but applicants do need to demonstrate a passion and commitment to creating in-roads for Australia’s beef industry. Application forms are available for download or by contacting applications@cattlecouncil.com.au. Applications close midnight Sunday 13th August 2017.